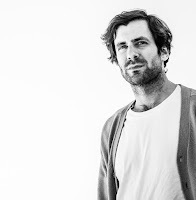 Slow Leaves is the nom de plume of Grant Davidson, singer-songwriter from Winnipeg in Canada. It is a collection of 10 demos he had lying around the house and started to work at with his accomplices. The result is the second album under this name after having released three albums under his own name. As a starter I am going to give a warning. To really enjoy Enough About Me a headset is a prerequisite and, without propagating any ear damage here mind, put the volume up a bit. Anything else in my experience leads to an album passing you by, in fact, an album that is pretty boring. Once I secluded myself from daily life Enough About Me opened itself and blossomed, fully, completely. 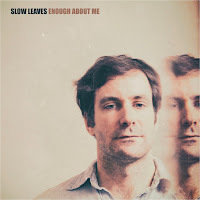 Slow Leaves captures the mood of the 70s on its new album. A song could have been sung by Gordon Lightfoot just to name an example. Some of the songs are in sync with a 'Sundown' for example. The way Davidson sings reminds me of Antony of the Johnsons, without those irritating, breathy trills in his voice, so totally enjoyable. An album like this does make me realise what an album by Antony could sound like and that comes as a bit of a surprise. So the basis is Grant Davidson's voice and his clear sounding acoustic guitar. Around that basis a singer-songwriter sound is built, giving the songs that little extra for a record. Without a problem the songs will remain afloat if Slow Leaves just performs them solo. The fun of Enough About Me is in the details. All the songs have these nice little embellishments. An organ, a pedal steel, an electric guitar to produce the additional melodies. The strength of the album is the ten songs it contains. Although certainly not of these times, there is not one weak brother among them. The music of Slow Leaves simply has nothing to do with 2018. At the same time the traditional sound of this album makes it sort of timeless. I can imagine it having been made over 40 years ago, but also in 2040. There will always be a market for contemplative songs played, primarily on an acoustic guitar. The exception is found in 'Chinatown'. An electric guitar drives the song, accompanied by the firm drums, underscoring the more acidic lyrics. 'You said my songs were setups for predictable rhymes". Well, that's a statement for a singer-songwriter to report on. A violin swerves between the whole making the song sound like a joke, that it is not. Slow Leaves comes close to the rock side of Josh Ritter here. With this I have said all there is to say about Enough About Me. This is an album for all who enjoy an album by a singer-songwriter with a fine voice between husky and normal.